One of our team members was surprised, last night (i.e. 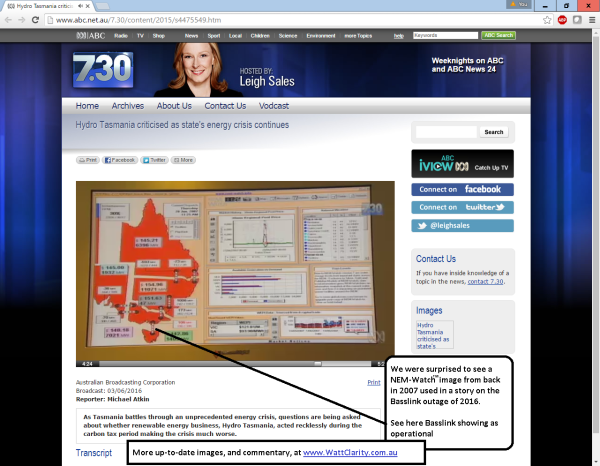 Friday 3rd June 2016) to see an old image of an old version of NEM-Watch (from way back in 2007) used to illustrate how Tasmania would normally be interconnected to the mainland by the sub-sea HVDC (high-voltage direct current) link connecting into the Latrobe Valley in Victoria. For those interested in the Tasmanian crisis, the ABC story here is worth a watch. Coincidentally it was also yesterday that I’d published these updated thoughts on WattClarity ® about the magnitude of the cost incurred, in aggregate, by various stakeholders in the Tasmanian region of the NEM as a result of the Basslink outage, now about 6 months old.